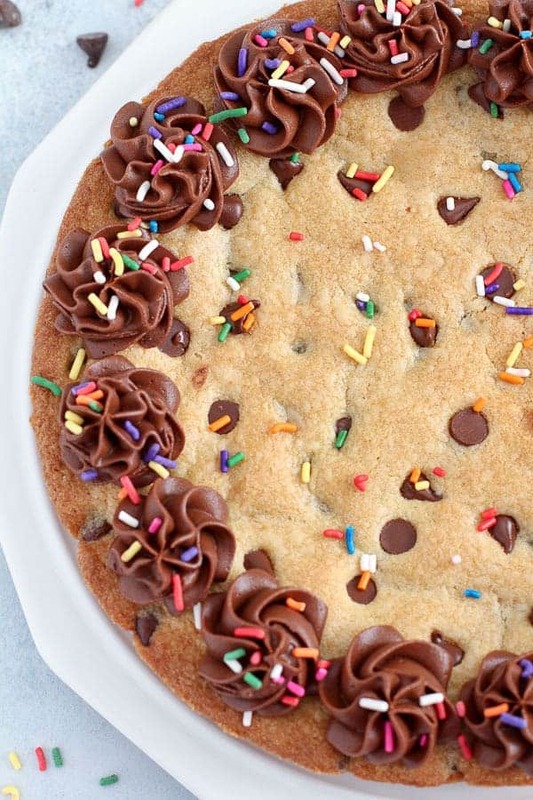 Cookie Pie – A giant soft and chewy Chocolate Chip Cookie baked in a pie dish and decorated with chocolate frosting. 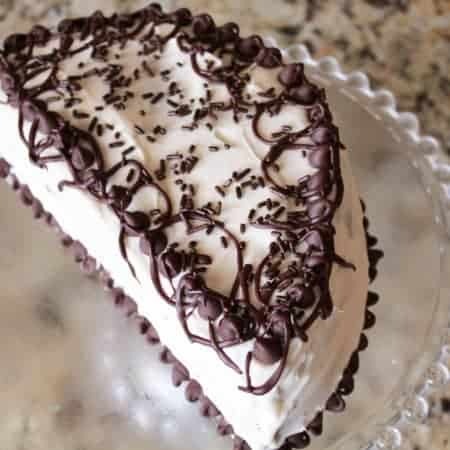 Perfect for any celebration, and way easier than making a cake! We’re celebrating today! Our sweet Jake is turning SEVEN! 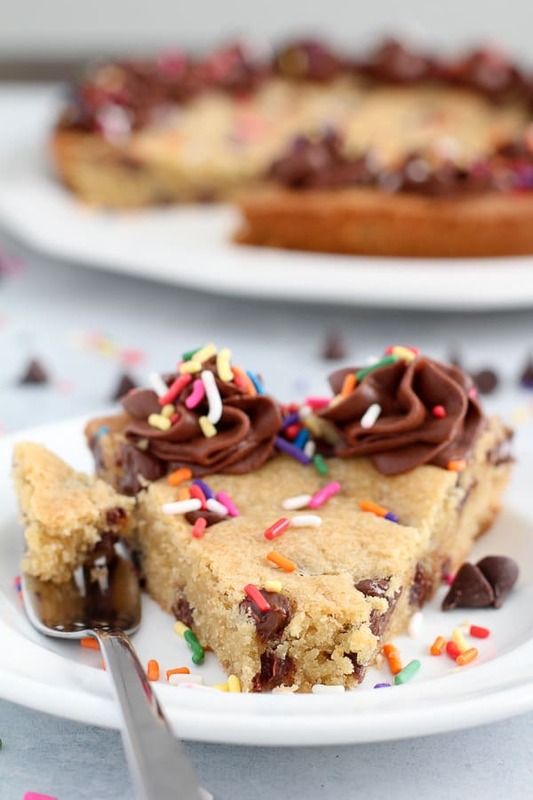 Jake is having several birthday celebrations this year, and this Cookie Pie will be making an appearance during at least one of them. Kids and adults both go crazy for this thing. Isn’t it fun?! 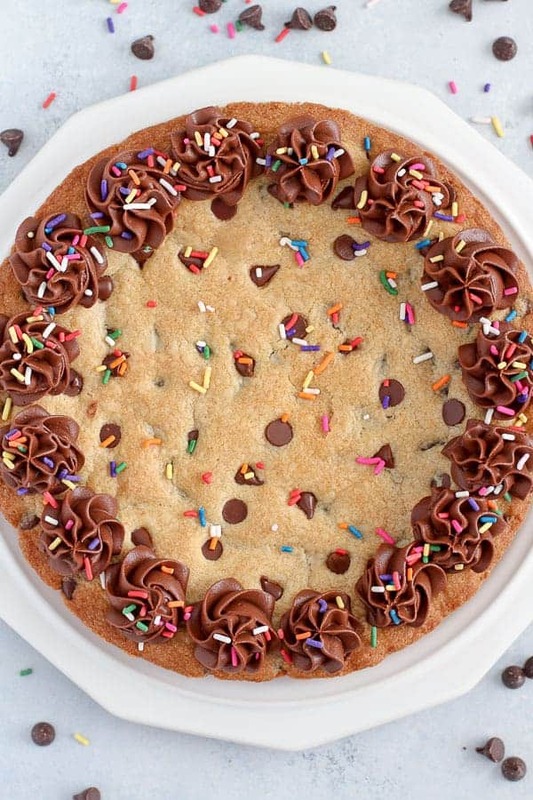 Note: I might also be living out my childhood fantasy of always wanting one of those birthday “cookie cakes” from the cookie shop in the mall food court. You know what I’m talking about, right? 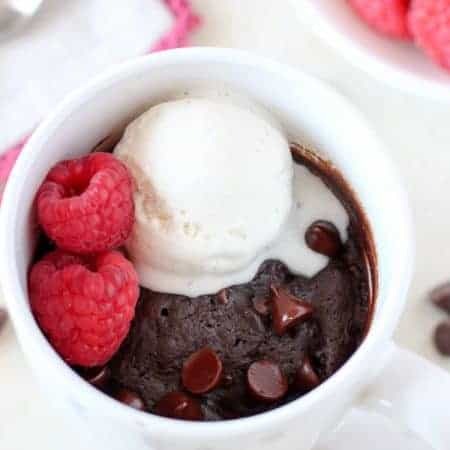 This is my version of those, but homemade … because homemade is always better. 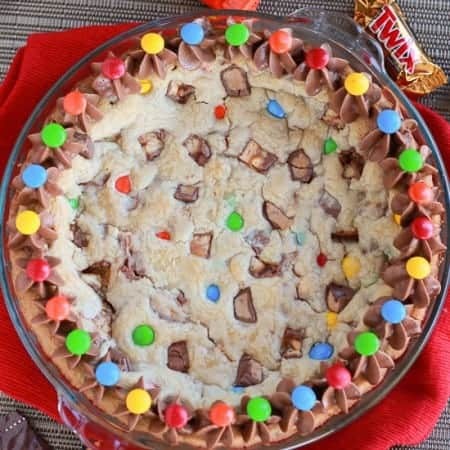 Mix up a basic cookie dough, add your mix ins (we’re using chocolate chips, but you could also use M&M’s or candy bars), then press it into a pie dish and bake it. Once it’s cooled, decorate the outside with chocolate frosting and throw on some rainbow sprinkles. 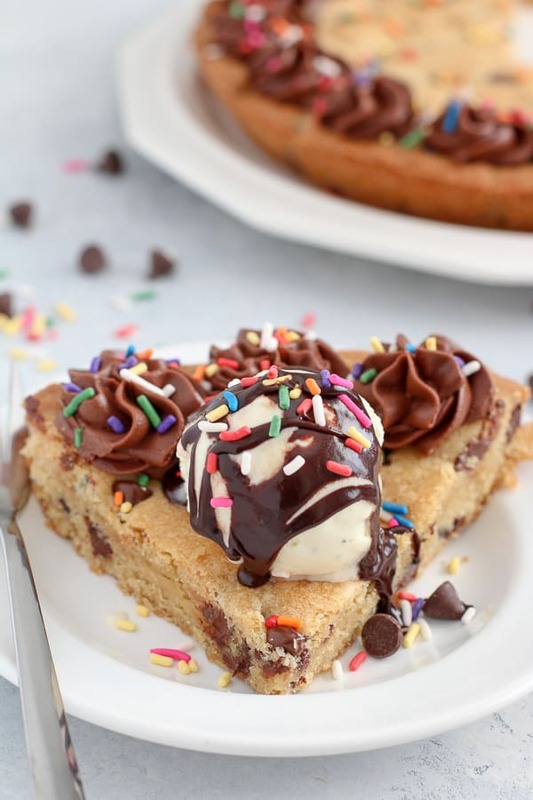 You can serve this Cookie Pie as is, or you can top each slice with a scoop of ice cream and some hot fudge. Either way it’s delicious! If you’re a fan of soft cookies this recipe is for you. I add a little cornstarch to the batter to soften it, and I also underbake the cookie just slightly. The edges are golden brown and barely crisp, and the center practically melts in your mouth. 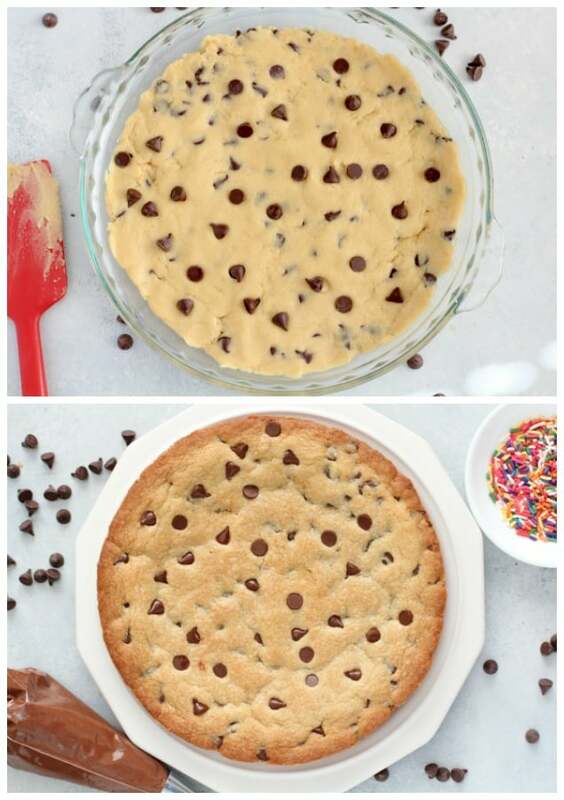 All that’s left to do is think of a reason to make this cookie pie. I’d say the fact that today is Friday is reason enough. Make it! 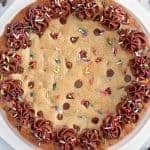 A giant soft and chewy Chocolate Chip Cookie baked in a pie dish and decorated with chocolate frosting. Perfect for any celebration, and way easier than making a cake! Using a rubber spatula or wooden spoon, stir in all but 1 tablespoon chocolate chips. Press the dough evenly into the prepared dish (dampen your fingers with water, if necessary). Sprinkle the remaining 1 tablespoon of chocolate chips onto the top of the dough, lightly pressing them down. Bake for 23-25 minutes, until the edges are light golden brown., and the center is still slightly underdone. Cool completely. Using a pastry bag with a decorating tip, pipe the frosting around the outside edge of the cooled cookie. Decorate with sprinkles. Looks great! Is it possible to put some filling in it, like a layer of chocolate pieces or Nutella? Sure! It will definitely taste great, but I’m not sure how neat the slices will be once you try to cut them. Hi! I;m sorry, but I don’t have the conversions. You can try using this guide. Enjoy! Thank you for your answer, I will try !